Sekaten ceremony starts on the 5th day of the Javanese month Maulud. People from Yogyakarta and villages around the city still believe that by celebrating Sekaten, particularly when listening to the sets of the Gamelan music, they will get rewards from the God Almighty, concerning their work, health and future. The first day of the ceremony starts at midnight with a procession of the royal servant, "abdi dalem" who walk in two rows bringing two sets of Gamelan named Kyai Nogowilogo and Kyai Gunturmadu. This procession leaves from the Ponconiti hall. 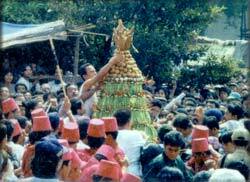 The climax of Sekaten ceremony is called Garebeg Maulud, held on 12th of the Javanese month Maulud. This festival starts by a parade of the Palace guard consisting ten units, namely; Wirobrojo, Daeng, Patangpuluh, Jogokaryo, Prawirotomo, Nyutro, Ketanggung, Mantrijero, Surokarso, and Bugis wearing their specific uniforms. The parade starts from the yard of the northern Kemandungan of the palace, crosses the Sitihinggil, and the pagelaran to the northern square. The Gunungan, made of food-like vegetables, peanuts, red peppers, eggs, and several delicacies from sticky rice. It is mountain shaped and symbolizes the prosperity and wealth of the Mataram's land.